Placing Ramp Under Front Wheel; Pickup Pulled Trailer Forward so Both Wheels Elevated. No Jack Required! Finished! Inflated Spare Mounted. Ready to Roll! 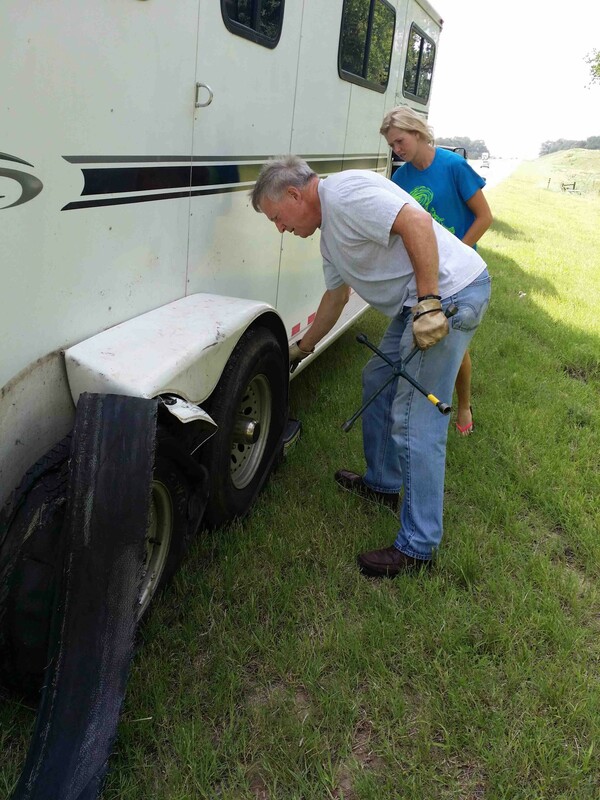 On June 29, 2014, the trailer, just south of Henrietta, Oklahoma on the Indian Nation Turnpike, carried several horses, and the tire’s tread had come off the wheel and became jammed between the tire and the metal fender. Karen, the driver, was travelling with her young teenage daughter to Oklahoma City, and they could not free the wheel from the fender to change the tire. Karen had a wood ramp about 6 inches high which we placed in front of the right front tire; this permitted her to pull the trailer forward so the front tire rolled up the ramp, elevating simultaneously the right rear wheel (with the flat tire) enough so we didn’t need a jack. I got to use my hack saw and bolt cutters (rare occasion for both) to cut away the mangled fender, freeing the tire to be changed. Karen also had no lug wrench with sufficient leverage to loosen several of the lug nuts, so I used my 4-way. Her spare tire was very low on pressure, so my compressor reflated it. I didn’t realize it until I had finished, but Karen had taken several photos as I cut the fender and changed the tire. When we were done she took a pic of me and her daughter standing by the finished work. Karen also later posted a very nice comment on my website (see way below). My criterea for an assist’s “goodness” includes difficulty, and benefit to the assisted. By that measure, this assist, on July 19, 2013, was one of my best. One mile from the north turnaround point of my I-95 “patrol” was a 2003 Lincoln Town Car on the right shoulder with flat right rear tire. Passengers were a 66-year old black couple, Reverend Richard Johnson and his wife. His church is Central Holiness Church in Columbia, SC. Richard is a large man with a severe mobility problem; he could never have changed a tire. His wife was more mobile, but frail. The couple was enroute to a funeral in Virginia, another 2 1/2 hour drive. Just after I pulled over, so did a NC Highway Patrolman, who had spotted the disabled car. He departed after I told him I’d take care of the flat. The assist started out looking like a routine flat tire change, but when I tried to put the spare tire wheel on the car it would not fit: the wheel’s holes would not line up with the car wheel’s lugs. I told Richard that the spare tire wheel didn’t come with his car, and it would not fit; I made certain that he could see the problem. Richard told me he had bought the spare that morning from a guy in Columbia (which explains why the spare had 40 psi). When I told Richard his only option was to replace the flat tire on the wheel with a new one, he agreed. I briefly considered telling him to dial *47 to get a tow truck, but I decided to take the plunge and take care of it myself, as I had told the officer! My Garmin showed the closest Walmart was five miles away in the tiny town of Erwin. I left the Lincoln elevated using a jack stand and put my jack and tools back in my trunk; then I wrapped the Lincoln’s flat tire wheel in an old sheet and tossed it in my back seat. The reverend and his wife got in too, and we headed to Walmart. We arrived at 7:05 PM; unfortunately, the tire repair crew had departed five minutes earlier. I consulted my list of Fayetteville tire stores and noted that all but one closed at 7 PM; but Pep Boys closed at 9 PM. When I called Pep Boys, the guy at the tires desk told me he couldn’t promise they could fix the tire before closing time since they had a large work backlog. On the way out of Erwin toward I-95 I stopped at an Advance Auto Parts store to ask about local tire stores; I checked out one, but it was closed. Richard and I decided to take our chances with Pep Boys, but we wouldn’t get there until 8:05 PM. With pedal to the metal enroute to Pep Boys (25 miles away) we discussed tactics for dealing with the tire desk. I advised the Reverend to tell them who he was and his situation; we would do a “one-two” on Pep Boys to get his tire. When we arrived, Robert, the guy behind the desk, was the one I had spoken with by phone. He told me that he had had no new customers since my call, so they would be able to mount the tire. The tire was ready by 8:50, so we loaded it and the the couple back into my car and headed back to the Lincoln, arriving at 9:20. The Lincoln was on a stretch of deserted highway in pitch black darkness. I put on my head lamp, positioned my three reflective warning triangles, jacked up the car a little to remove the jack stand, and mounted the wheel on the Lincoln (all the time swatting mosquitoes). During our rides to and from the tire stores we didn’t discuss the Trayvon Martin/Zimmerman case (which had just ended, creating black-white racial tension nation-wide); in fact we didn’t discuss race at all. We talked mostly about our families. Both he and his wife were intelligent, good folks. They have been married 47 years and lived in Columbia the whole time. Both of them really liked and appreciated my deed, and Richard assured me that he would talk about it extensively in church. So, I know the 3-hour odyssey was worth it! On May 25, 2014, at the very end of my normal “patrol” on I-95, I encountered on the shoulder of the exit a red heavy duty Chevy pickup towing a large box-shaped trailer with the front tire of its two left tires flat and shredded. A white VW Passat was on the shoulder behind the trailer. “Ron”, the pickup driver, and “Debbie”, his wife with the VW, were travelling from Montclair, VA, to Myrtle Beach. Inside the trailer was a 4,000-pound 1962 Chevrolet sedan with a “454” hopped up engine. Ron told me he had had another flat on the trailer this morning, so he didn’t have a working spare. The time was 5:15 PM on a Sunday; the only tire store open in Fayetteville was Pep Boys, which closes at 6 PM on Sundays. Ron took my suggestion to call Pep Boys to see whether they had tires to fit his trailer; the store said they had two in stock. I deployed my three reflecting warning triangles behind the VW and prepared to depart for Pep Boys. Since we didn’t have time to remove Ron’s flat tire, we put the rim with the morning flat tire (wrapped in an old sheet) into my Accord’s back seat, and Ron and I departed. When we arrived at 5:45 they were expecting us and got right to work installing a new tire on the rim. “Robert” and “Pamela” behind the tire counter recognized me from several previous similar events (such as the one last summer with the minister, Richard Johnson, from SC with the Lincoln Town Car): Smiles and laughter. Turns out the store actually had only one tire in the correct size, so Ron asked Robert whether he could get more from the warehouse; if so, Ron would stay in Fayetteville tonight and buy all new tires in the morning. I never heard the result from this query, but I mention here it since it was a smart idea. Pep Boys finished with Ron’s new tire as they were locking the store’s doors to close. We placed the mounted tire in the back seat of my car and headed back to I-95. Back at Ron’s trailer at 6:30 PM, he showed me how he could raise the wheel with flat without using a jack, simply by backing the trailer’s other left wheel up a small wood ramp about 6 inches high. Slick; I’ll include that technique in the next edition of my book. But first we had to loosen the lug nuts on the trailer wheel. Ron had several tools, including ½-inch drive ratchet wrench, correct size socket for the nuts, a small 4-way lug wrench, and a cheater bar. I let Ron try to loosen the lug nuts, but they were on too tight for his 4-way. He then tried unsuccessfully with his ratchet wrench enhanced by his cheater bar – which broke the ratchet wrench (not designed for big torque). I then suggested he use my breaker bar with extension (to achieve standoff from the recessed lug nuts) and my cheater bar; first I sprayed some “PB Blaster” anti-rust fluid on all the lug nuts. Using my tools, Ron managed to loosen all the nuts. Then, when he tried to spin off the nuts with his small 4-way (in this case it would have been a long process), I handed him my old-fashioned speed wrench, which he used. Ron did all the muscle work removing the rim with flat and mounting the rim with his new tire. The whole assist took almost two hours, but it was a good one. After gathering all my tools and my triangles I prepared to leave. Ron first offered to pay me $100, but I declined it. Then he asked if he could buy one of my two 10-inch extension bars, in case he had another flat. I told him he could have it, but he insisted I accept a $20 bill. I took the bill and then found a copy of my new “Roadside Survival” book in my car and gave it to him. He showed it to his wife, and she asked me to sign it. She was delighted to get the book and said she would recommend it to all her friends. Mega-thank you’s, and we split. Visiting my youngest sister in San Antonio, she and her husband said they were considering buying a pre-owned 2007 Honda Accord like mine, and they asked to go for a ride in mine. Out on Loop 410 we spotted a broken down Chrysler Town Car; my sister said, “I want to see you in action”, so I pulled over. “David” was the minivan’s driver. First thing I did was to deploy my reflecting triangles, since we were just over a hill barely off an exit ramp. I used my low-tech, old fashioned speed wrench with socket to lower his spare by turning a bolt in the floor of the rear floor of the Town Car. The 20-year old donut spare tire had 20 psi, so my air compressor inflated it to 60. Unfortunately, he was missing some of the parts for his jack, so we used my hydraulic jack with lumber underneath to stabilize and add elevation. Worse, one of his lug nuts was frozen on the wheel lug, probably stripped and forced on from a hasty earlier tightening with an air wrench. My 4-way wrench wouldn’t provide enough torque to twist the stuck lug nut, so out came the heavy stuff: breaker bar reinforced by cheater bar, all turning a 21mm socket on his stuck lug nut – which sheared the wheel lug and freed the flat tire rim. I mounted the donut using the remaining four lugs, and suggested strongly that David drive directly to the closest tire store; he said he would. Handshakes and thank-you’s. My brother-in-law retrieved the triangles, and we departed. My sister had become a believer! I was driving alone from Fayetteville, NC, to visit my father-in-law in Kingsport, TN. On I-77 just north of the VA-NC border on a long, steep climb in mountains, around 2:30 PM, I pulled over for a broken down 1995 Jeep Cherokee on the northbound shoulder. Very soon I realized that the elderly couple in their late sixties, the Stewarts, were both deaf mutes. We could communicate only by writing notes on a paper tablet. The vehicle’s engine had overheated but had cooled enough to remove the radiator cap. From my two 1-gallon water jugs I poured five quarts of water into the radiator so the couple could drive off the interstate. They drove uphill slowly as I followed, to the next exit at the top of the hill (Exit 8), where we stopped at a filling station. At this point, since neither “customer” could converse audibly with others in person or on a telephone, I decided to stick with them until we could at least get a good diagnosis of the vehicle. I asked “Nikki” at the store counter where the closest mechanic worked. She identified a mechanic, John Lester, at Exit 1, back down the hill we had just come up, and gave me his telephone number. She also talked to Lester to be sure he could see us. Before leading the couple back to Exit 1 (all downhill), I topped off the Jeep’s radiator with another two quarts and then filled both of my water jugs. At Lester’s garage, I explained the situation to them, and he and some associates preliminarily diagnosed the problem as a cracked head gasket, serious business which could cost $1200, require 14 hours of work, and would not happen until Monday. The Stewarts decided they wanted the Jeep towed back home to Charlotte, NC. They had AAA roadside assistance insurance, but they could not contact AAA by phone because they couldn’t speak or hear. I called AAA for them and, after being routed through a couple of offices, finally got the “Mid-Atlantic” office, which had jurisdiction. The couple’s coverage included free towing for 100 miles, with $4 for each additional mile: excellent since we were just over 100 miles north of Charlotte. The tow truck, arranged by AAA, was due in an hour, but AAA needed a phone number on site. Lester was overdue to shut his doors and release his crew for the day, so there would be no one there with a phone for the tow truck. At that point I decided to stay and wait for the tow truck, so I gave AAA my cell number. As we waited for the tow truck, the wife told me they had reservations that night at the Super 8 Motel in Radford, VA, and she asked me if I would call the motel to cancel the reservations and obtain a refund. When I spoke with the clerk there he told me the couple had paid for the room through a third party, so I would need to check on that with that party. Turns out that party was not Expedia, as first said, but Hotels.com. Finally, after explaining the situation to Hotels.com they agreed to waive the normal 24-hours-in-advance rule, and refund the $72.09 payment. The tow truck showed up on time, and I eyeballed its driver, who looked a lot like Willie Nelson with a huge bushy beard, and explained to him what had to be done, and told him to take care of the couple. Many, many silent and very sincere thank-you’s and hugs from the Stewarts, and they climbed into the truck’s cab for the ride back to Charlotte. I watched the truck pull away with the Jeep and my new friends. Then, with a very warm, good feeling, I practically floated on Cloud 9 to for the rest of my trip to Kingsport. Goes to show how much difference an easy, low tech assist can make. Made their day; mine too! The Toyota Highlander was stopped on the Interstate 10 shoulder; right front tire was flat. Its occupants were roasting on the hot summer day. “Joseph” from Cameroon, the driver and father of the family, told me that he couldn’t get to his spare tire because the vehicle’s rear hatchback, which covered access to lower the spare, wouldn’t open. So I jacked up his vehicle, removed the flat tire wheel, wrapped it in an old sheet, and put it in my car. Joseph and I took it to a Walmart for repair (all it needed was a valve stem!). While there I pointed out a portable 12-volt jumper battery/compressor which could come in handy; he was not interested. Tire repaired, we returned to his vehicle, where I remounted the wheel. His 8-year old twin daughters, coached and rehearsed while Joseph and I were gone, performed a really cute, lively “Thank You” dance for me. Very nice! Before I departed I suggested Joseph visit the nearby Toyota dealer to fix the latch on his rear door; he declined, saying he was in a hurry. His wife remarked acidly, “We might as well not have a spare tire”. I decided to leave before their fight! After taking the next exit and returning toward the Toyota I noticed that it had not moved. I circled back and again stopped. Evidently, while Joseph and I were away, the family had used the sound system, running down the vehicle’s battery. So I gave him a jump start. I then gently reminded him about that portable jumper battery we had seen, suggesting he might want to reconsider. He smiled and said, “No I don’t think so”, before thanking me and driving away. 1) Don’t drive without a spare tire, especially in hot or cold weather with one’s family. Not having access to the spare is the same as driving without it! 2) If you know of a problem which restricts performance of basics such as changing a tire, get it fixed before a trip: “Good luck generally follows those who help themselves”. 3) Consider keeping in your vehicle a 12-volt portable jumper battery and a 12-volt air compressor. Note: portable batteries require periodic recharging (after each use or monthly, at least); otherwise they will underperform. Total loss of charge will end the batteries’ effective life. 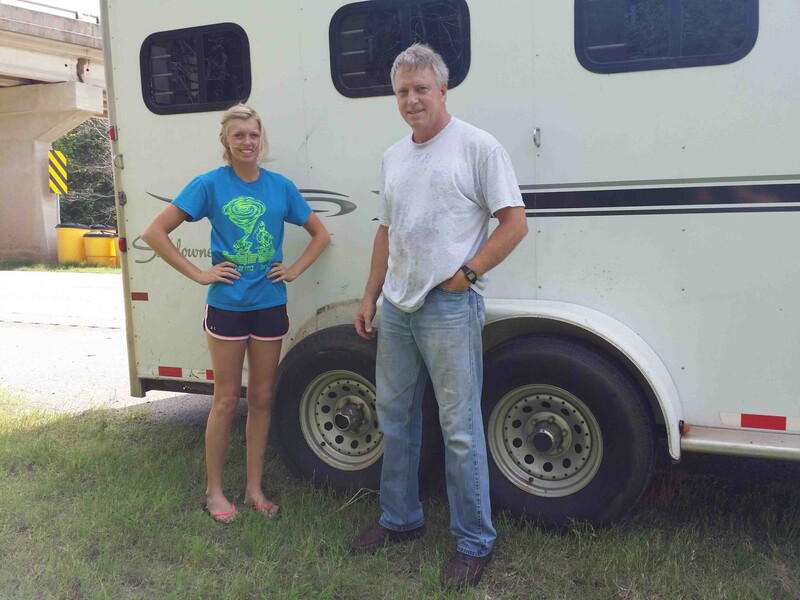 My horse trainer & I were driving from Miami, Florida to Raleigh, NC hauling my horse trailer with 3 horses. It was about 6:30pm & we were about 45 minutes from out destination, when one of my trailer tires blew out & the other wheel flew off into the woods. I have road side assistance for my horse trailer & I contacted them. While we were waiting on the side of the interstate Mr Brinker stopped to help us. My truck & trailer r extremely high & he tried and tried to get the trailer jacked up high enough. The road side people arrived & together they were able to put my 2 spares on the trailer. Mr. Brinker was a life saver & gave me a new outlook on life that there are still caring people left in the world. Thank you so much for stopping & helping 2 stranded cowgirls!! Patty, The experience trying to lift your horse trailer high enough to change its tire caused me to upgrade my collection of jacks; I have used my new jack successfully several times, and it would have made your assist a snap. I’m happy you made it home that day. My biggest worry during the work on your trailer was getting “dumped on” literally by your horses, whose rumps and tails were right above my head! Walt was our super hero today on the Indian Nation Turnpike just south of Henrietta. My daughter and I were traveling back from a barrel horse clinic in Texas. The back tire on the trailer blew out and ripped part of the fender off and jammed it into the bad tire. He stopped and had the tools to cut the damaged fender off and helped us get back on the road. I will definitely go through the book and change what we carry with us. I’m so glad that Walt was there today. Karen, I really enjoyed meeting you and your daughter; glad I could help. 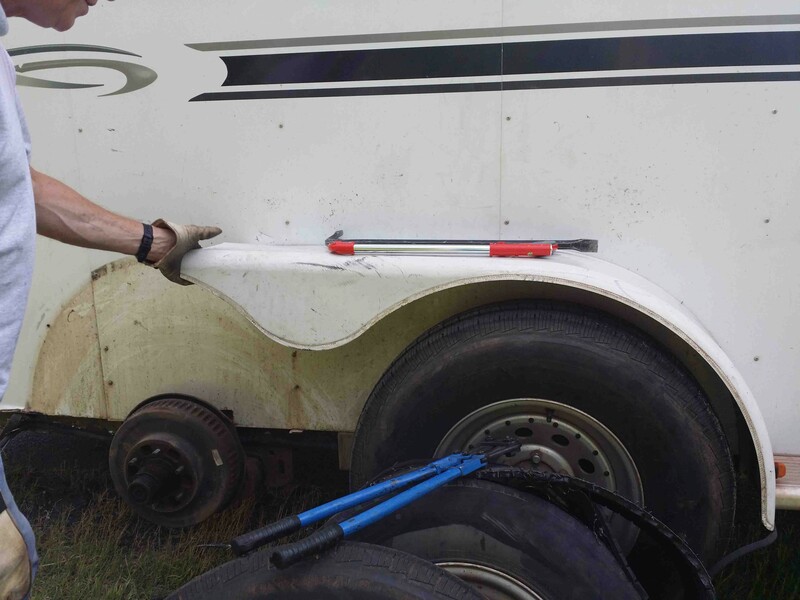 I don’t often get a chance to use my hacksaw and bolt cutters, but they sure came in handy cutting away your trailer’s damaged fender. As you’ll see in the book, trailer tire age often is a big factor in their safety. You may want to check the ages of your trailer tires (from the DOT number on the sidewall) and replace them if they’re older than six years. Glad to see that you made it home safely! We were traveling back from Asheville, NC yesterday when a tire on our camper blew out. We thought we were pretty much equipped for whatever, but guess we weren’t. I was on the phone with AAA to have them come out to help us when Mr. Brinker showed up. Mr. Brinker had everything to get our camper high enough to get the blown tire off & new one on. Mr. Brinker suggested that we go to the nearest Wal-Mart & get another spare tire & Thank God we listened to him because about 30 miles from home we blew another tire out. We were able to get this one changed ourselves by watching what all Mr. Brinker had & used. Mr. Brinker was our life saver yesterday. God works in ways that we just can’t explain & this was one of them. Mr. Brinker you are a work of God! God Bless, safe travels & Thanks so much again for what you are doing. Thanks much for that nice posting! I really enjoyed meeting you. I had used the technique of placing lumber under the trailer’s other tandem wheel only a few times before, and I have amended my book to describe the measure. Glad to hear you had the new spare to contend with your second flat! I guarantee you’ll be even better prepared to avoid a “next time”, and to contend with it should it occur, by reading my book described in this website. Walt, if you don’t mind I want to take this time a space to say thank you to you and everyone who helped me on Sunday, July 6, 2014. I ride a 2009 Harley Davidson Ultra Classic. The Ultra Classic is Harley’s biggest bike, for those that don’t know, it is similar to the police/highway patrol motorcycles. It weighs almost 900 pounds, more when loaded with tools, rain gear, etc…, but the one thing a motorcycle does not have, is a spare tire. On July 6, 2014, I was on my way home from a family reunion on I-40 headed east toward Knoxville, TN when the rear tire blowout. Not a pretty site, and even more scary for anyone riding or witnessing what happens to a motorcycle when a tire blows. Its like riding a wild bucking bronco that is determined to throw you to ground and leave you for…, well you get the idea. However possible, I managed to get the bike from 70 mph to zero and parked on the shoulder of I-40 without any damage to me or the bike, or anyone else for that matter, well other than the rear tire that appears to have suffered a cut at the side of the thread pattern. Watch out for road debre. Anyway, I want to thank all the Guardian Angles, Good Samaritans, and family members who helped me out that day. First, thank you to whomever or whatever spirt you believe in that was riding with me to help me stay calm and successfully bring the bike to a safe and upright stop on the shoulder on I-40, thank you God. Next, thank you to Pete Kulp and Sue from Oklahoma, who witnessed the event from not far behind and prepared to block traffic from running over me should I have gone done on the roadway, and also did stop immediately on the shoulder to rescue me. Pete had suffered a rear tire blow out in the past on his own motorcycle, and knew immediately what had happened when he saw the bike fishtailing all over the road. They were on there way to Pigeon Forge, TN, with a goose neck camper and motorcycle on a trailer behind the camper. Pete had room on his trailer for my bike, but neither of us had extra tie-downs to safely secure the bike to his trailer, so he offered to give me a ride. We were 120 miles west of Knoxville at mile marker 260, while Pete drove Sue and I starting searching our smart phones for an open Harley dealer or other cycle shop, but had no luck as it was Sunday over the Independence Day weekend. The nearest open dealer I could find was Knoxville Harley Davidson, and since I live just outside of Knoxville, Pete and Sue gave me a ride to exit 374. Thanks to Pete and Sue, I only had to walk about 300 yards to the Harley dealership, where thankfully, my Daughter, Ellora, and three year old Granddaughter, Breeanna, picked me up. Ellora drove me home to get my trailer, with Breeanna laughing and giggling the whole time because she got to see her Zoom Zoom and she knew she would soon see her Nana. By this time, my wife Marcia, aka Nana, had woke to my phone messages and had called to let her employer know she would not be into work as she needed to come a get me at mile marker 260. She soon got a big surprise when she walked into the kitchen, with shoes still in hand, to find Breeanna, Ellora, and myself walking in the door from the garage. We got the trailer hooked to the CRV, tie-down straps, jack stands, and floor jack loaded and Marcia and I headed back down I-40 to get the bike. While I was riding to Knoxville in the truck with Pete and Sue, I had called my brother Gary, who lives near Jackson, TN, about 180 miles west from where the bike was parked on I-40, and he had agreed to meet me at the bike to help get in loaded. Thankfully, he brought more help, Brandon, his step-son-in-law rode with him on there bikes, along with Brandon’s son Brodie on the back of Gary’s bike to meet us and help get my bike loaded. However, we would have never got that bike loaded without Walt Brinker and his trunk load of jacks, tools, and brain power. Shortly after my wife and I had backed our trailer up to the bike parked on the side of I-40, Walt pulls over and offers his help, he told us who he was and that he was on his way back home to North Carolina after a TV appearance in Houston, TX, regarding his book, “Roadside Survival Low-Tech Solutions to Automobile Breakdowns”. As you know from reading this the bike had a blown rear tire, which made it set too low to the ground for me to get my jack far enough under the rear of the frame to balance the bike. Additionally the tire had come off the rim and was wedged between the rim, the rear swing arm and brake caliper. Simply, put the bike could not roll and was not going to moved by hand. I still find it hard to believe I got this thing stop on the shoulder without wreaking it. Walt told me this was his first motorcycle assist and begin pulling tools and jacks out of his trunk. With Walt’s help and that of Gary, Brandon, and Marcia, we managed to use two of Walt’s jacks to get the bike high enough I could get my bike floor jack under the frame to balance and lift the bike. Walt quickly handed me a large flat screwdriver and a claw hammer from his trunk which I used to work the tire back onto the rim. This did not mean that the bike was going to roll easily onto the trailer, it still weighed close to 900 pounds, but at least I could now roll the rear wheel. So, with the trailer gate down, which also functions as a ramp, I backed the trailer under the bike as far a I could, we let the jack down and removed it with the front wheel now almost half way up the ramp. Gary drove the bike, he had the longest legs, and the rest of us pushed, that is until the bike frame bottomed out on the trailer frame. Umm…, no way to air up a blown tire, no way to jack up the bike while half on half off the trailer, and too heavy to lift it by hand not even just enough to clear the frame. Just then Walt looks at me and says “Why don’t we just jack up the trailer gate to level the rear of the bike with the front. Duh…, why didn’t I think of that? I felt like the truck driver who’s truck was stuck under the low overpass, when the kid said “Hey, mister, why don’t you just let some of the air out of you tires so you get your truck out from under that bridge?”. Walt grabbed his jack and I grabbed mine and we started jacking up the trailer ramp so Gary could just drive the bike the rest of the way onto the trailer. We soon secured the bike, jacks, and tools, said our thank you’s and goodbye’s, and were own our way home with bike in tow. One of the first things my daughter said was “Dad, I’m sorry your having such a bad day”. I replied “A Bad day, I’m having a great day, I didn’t die, I didn’t get hurt, the bike didn’t get hurt, and I only had to walk about two blocks, considering all that’s happened today I’m having a great day”. Now, you could say I’m the luckiest man on the planet, but it would be more appropriate to say that I am the most blessed man on the planet. Thanks to Walt, Pete, Sue, and all my family members we arrived home safely with the bike just before 10 p.m. that Sunday night. You couldn’t asked to be more blessed than that. The pleasure was mine; I very much enjoyed meeting you and your family! Thank you for that very nice comment. Glad to hear that you made it home safely. Meeting you was not my first motorcycle assist, but it was my first with a Harley with blowout. Now I’ll be more ready for the next one. I have done several plug jobs on flat motorcycle tires, but plug jobs don’t work with blowouts! A little adversity is good for the soul, as you discovered. You are a true life saver. With a blown out tire and a truck bed full of furniture, you appeared out of nowhere. Your timing could not have been better. Your tips and on-the-spot tutorial have not been forgotten. The tire has been replaced and the spare is back in its place. Thanks for that nice comment. Please pass it on!